Lethal earthquakes have plagued China throughout its history, the latest coming late Tuesday when a 6.5-magnitude quake hit mountainous southwestern Sichuan province, killing at least a dozen people. It was followed by a 6.3-magnitude earthquake more than 2,000 kilometres away in northwest China's Xinjiang region early Wednesday, but there were no immediate reports of damage or casualties from the remote area. The world's deadliest earthquake is thought to have been the huge 1556 disaster that struck northern Shaanxi province, with estimates of the toll put at more than 830,000 people. - December 16, 1920: 230,000 perish in an earthquake with a magnitude of 7.8 in the northwestern province of Gansu. - May 23, 1927: 41,000 people die in Gansu in an earthquake measuring 7.6. - January 5, 1970: 15,621 are killed after an earthquake of 7.5 magnitude in southwestern Yunnan province. - May 11, 1974: An earthquake of magnitude 7.1 hits the southwestern provinces of Sichuan and Yunnan. Estimates of those killed range widely from 1,500 to 20,000. - July 28, 1976: The industrial city of Tangshan, 200 kilometres (125 miles) east of Beijing, is levelled by an earthquake measuring 7.8. Estimates of the death toll range between 250,000 and 800,000 people. - February 3, 1996: Up to 300 are believed killed and thousands injured in a quake measuring 6.6 near the city of Lijiang, in Yunnan. - May 12, 2008: An 8.0-magnitude earthquake strikes Sichuan, leaving nearly 87,000 dead or missing. The quake is felt in the capital Beijing, 1,800 kilometres away. 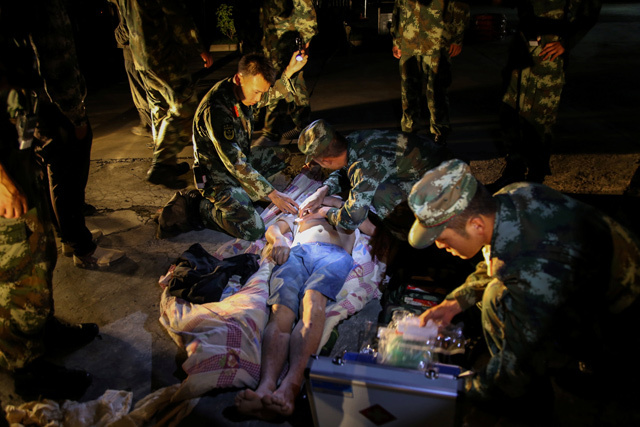 Another 4.45 million are injured in the worst quake disaster to hit China in a generation. - April 14, 2010: A 6.9-magnitude earthquake in a largely ethnic Tibetan region of Qinghai kills nearly 2,700 people and leaves more than 12,000 injured.